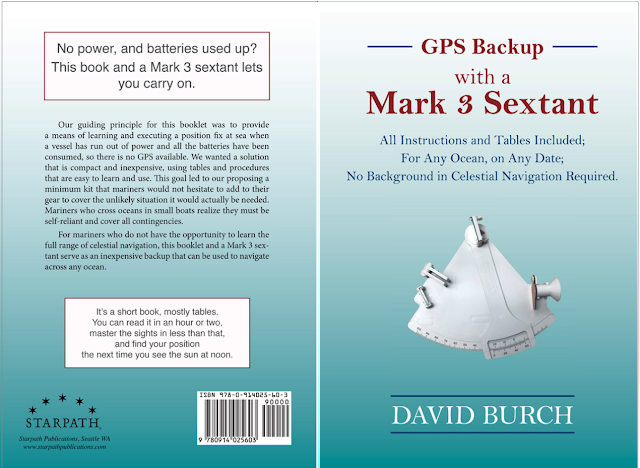 We published a short book last year that is intended to be the bare minimum celestial navigation training that will serve as a backup to a loss of GPS. 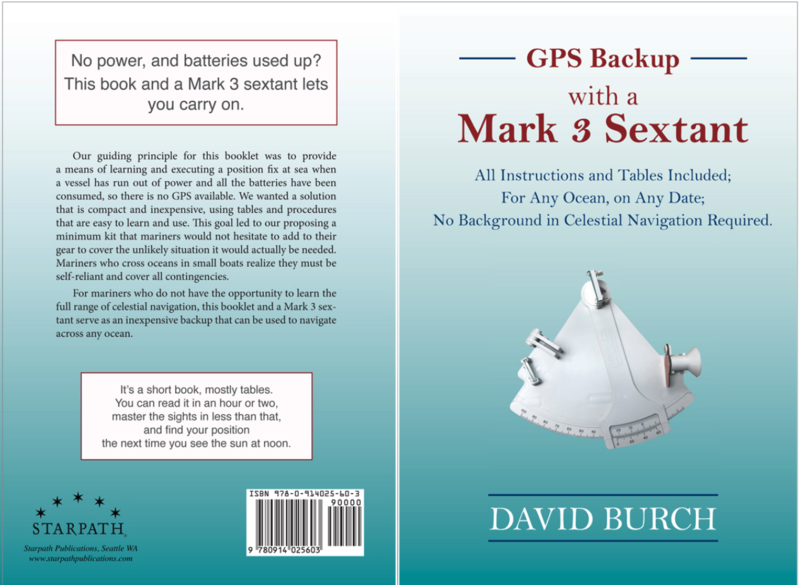 In keeping with the backup concept, the book is presented in such a way that it is totally self-contained, which means the book also covers how to use the simple Davis Mark 3 sextant. This is a small device, for under $50, that could be used to safely circumnavigate the world. Our promise is that this book could be opened up and read for the first time when it was actually needed, and it would be adequate to teach how to take the sights, and then find your position from them using only data in this small book—a large part of which is a custom Sun Almanac designed to make the position solutions especially easy. The techniques taught in this book are finding Lat and Lon from "noon sights" (local apparent noon, LAN) as well as Lat by Polaris in the Northern Hemisphere. What we forgot to include in this first printing was a way to determine an efficient time to start taking the sights near midday. 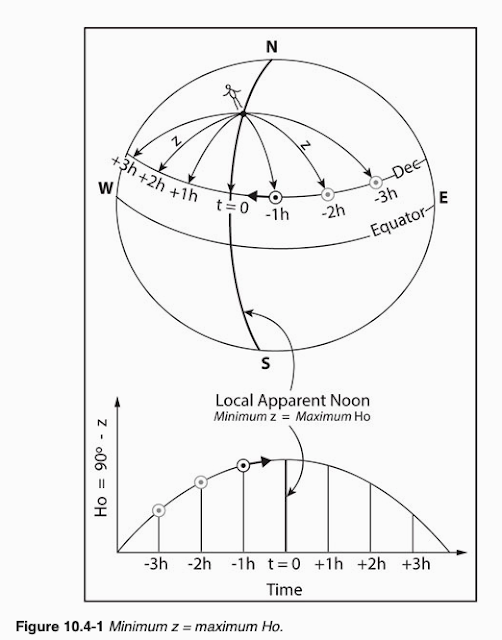 LAN occurs when the sun crosses our meridian, bearing due north or due south at its peak height in the sky. When the sun is less than halfway up the sky at noon, we can approximate its motion along the horizon as a bearing change of 15º per hour. So if we want to start about 30 min before the sun reaches the horizon, we would start taking sights when the sun was bearing about 173 T. After that first round of sights, we will know the time of LAN and the next day we can fine tune the starting time. When the noon sun is much higher in the sky it is more difficult to predict its bearing change rate as it approaches noon, and as we head off toward the tropics the sun will indeed be much higher at noon, so it is valuable to have a systematic way to predict the time of LAN to plan around. The custom Sun Almanac offers an easy way to do this. In fact, it is easier than the standard methods we use when teaching the "full cel nav" course. The full theory is in the picture below from our textbook Celestial Navigation: A Complete Home Study Course. As the earth rotates toward the east, the position on earth directly below the sun (its geographical position, GP) moves west at the rate we are rotating, namely 360º of Lon in 24h = 15º of Lon per hour. The custom Sun Almanac tells us the longitude of the GP (called its Greenwich hour angle, GHA) every hour of every day. So we can go into Sun Almanac on the right day to see which whole hour of UTC has the sun's GHA just east of our location. Then we subtract that GHA from our DR-Lon to see how far it has to go (as an angle) to get to us, and then we just covert this angle to time at the rate we are turning, which can be derived from 15º = 1 hr, 1º = 60 min/15 = 4 min, etc. Example 1. 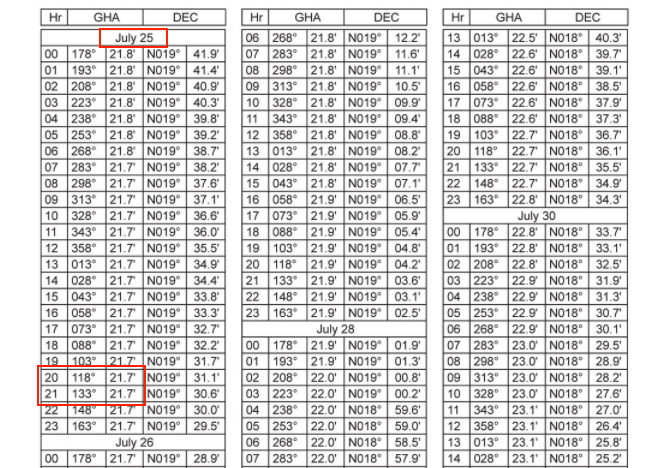 July 25 from DR-Lon = 122º 18'W. Final time is 20h 15m 45s, which we would round to 2016 UTC, as we never need to know these times more precise than that, not to mention that the DR position that it is based on has some uncertainty. This is the UTC of LAN observed from 122º 18' W. If we wanted the watch time (WT) of the event for a watch set to zone description (ZD) + 7, then we would have to back out that ZD. Recall the definition of ZD, which comes from this equation UTC = WT + ZD, where WT is the watch time being used for navigation. Thus if the ZD = +7 and the WT = 1200, then the UTC = 1900. Likewise if we know the UTC is 1900 on a watch with ZD = +7, then the WT = 1200. In the above example, LAN = 2016 UTC would correspond to WT = 1316 for a watch set to ZD = +7. Example 2. Find UTC of LAN on October 27 viewed from 136º 10.5' E.
This is an eastern longitude. In east longitudes the GP of the sun is still moving west with increasing time, so the longitude it crosses gets smaller as it passes across the eastern half of the globe. But that does not matter to us, because, unlike longitude, GHA does not decrease on the eastern half of the globe. GHA is defined as 0º to 360º, measured west from Greenwich. Our job is to determine what GHA does 136º 10.5' E correspond to. Starting at Greenwich we head west to 180º W (the dateline), and then proceed from 180º E to 136º 10.5' E, or we cover 180º - 136º 10.5' = 179 60 - 136 10.5 = 43º 49.5', which is what we must add to 180º to get the GHA equivalent of this eastern longitude. The answer is 223º 49.5'. Now we are back to solving the problem just as we did for western longitudes. If we need to convert back to WT, we refer to the definition: UTC = WT + ZD, or with ZD = -9, we WT = UTC +9h = 1139 WT. 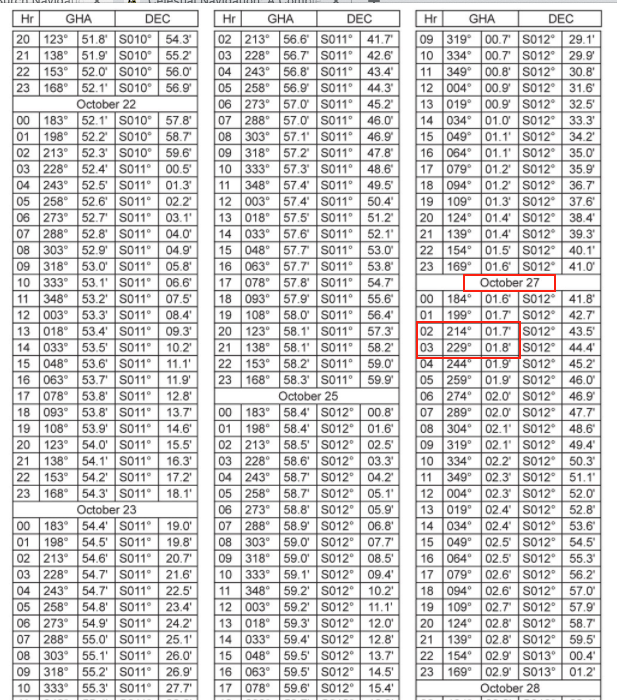 For those who might like extra practice, you can use the USNO sun data computer (Form B) to randomly select locations and dates to compute UTC of LAN (they call it "sun transit"), and compare that with what you get from the custom Sun Almanac. In principle the answer depends on the year, but our custom Sun Almanac averages out yearly differences, but even with this, the time of LAN found from the these tables will always be right to well within one minute. We refer to this document in our teaching by its file name "rfax.pdf" rather than its title for a couple reasons. First, even though the content and title of the book have changed over the years, the filename since it was first put online has not changed; you can always find this with a search for "rfax.pdf." This is now a free PDF, but back before internet it was a must-have nav pub for ocean navigation. In those days, in keeping with its earlier title (below), the pub included the voice broadcast schedules as well as radio fax schedules, including valuable global diagrams of the forecast regions. Oldtimers with memory of ocean sailing before the internet will recognize this book that everyone had on board. For historical interest, old versions are online. Secondly, beyond containing all the radiofacsimile schedules from around the world, it has also for many years now included the best of all of the official references to the FTPmail service offered by NOAA. This part of the publication has been hidden in this pub since it was added some years ago by not being mentioned on the title page or bookmarks. It was at the end of the document as "Appendix B," but the only bookmark was to Appendix A-8, without a title. Granted, if you did read to the end of the Table of Contents you would see it listed as Appendix B. In this new edition, the FTPmail instructions are in the same place, and they have minimized the confusion by removing any reference to any appendix in the bookmarks. Appendix A is also valuable for mariners including contact info for all branches of NWS as well as a detailed list of all weather resources online. Appendix A and B are major resources, not implied by the title of the document, so we just have to know they are there... which you would know from our weather book as we have stressed the value of this reference of years. I am hoping that if anyone from NOAA sees this note they might consider reissuing this latest version of rfax.pdf to include a mention of these important references in a subtitle of the document (such as "and Related NWS Resources"), and add bookmarks with real titles. Also if they do make a new one, I hope they will also update the section at the end on the Voluntary Observing Ship (VOS) information, including the links to Port Meteorological Officers (PMO) listed. PMOs are the key liaison between participating ships and the weather service, and their personnel and contact information in this April 2019 issue is a year or two out of date. Having that data wrong is incongruous in that the book starts out on the first page of text praising the VOS program and how important it is to mariners. There is another subtle reason modern mariners have an interest in this rfax.pdf document, even if they do not receive weather maps by rfax, but instead get their maps by email request. What we learn from this document is which nations actually produce synoptic weather charts. If such maps exist, they are the products of professional meteorologists, and not just reprints of a GRIB presentation of a pure model output. As such, they add much to our confidence in forecasts compared to using pure model data alone. Once we know these maps exist, we can go about finding out how to get them by email request. We have compiled a list of Southern Hemisphere sources, and we can find international sources in the FTPmail folder on line—see, for example, the file called otherfax.txt. The rfax.pdf also tells us when these maps are available for email request, as they must certainly exist at the time the rfax version is broadcast. One possible reason why these valuable FTPmail instructions in rfax.pdf are not being stressed as much as I think they should be, is the NWS is working on new publications devoted to FTPmail. Historically, the most often referred to instructions for FTPmail is a file called FTPmail.txt, which is pretty much unchanged since the system was developed many years ago. It is an introduction to conventions, along with a list of links to more detailed product lists, i.e., otherfax.txt. One version of the developing new instructions can be found at a link at the Ocean Prediction Center (OPC) under menu: INFORMATION / Receiving Products / FTPMail: Products via Email, which is a more convenient version of FTPmail.txt. Another version is attributed to the VOS. Find this one at the OPC menu: INFORMATION / Product Information / Product Guides / Marine Radiofax Chart FTP Email Procedures. This one has the valuable feature of showing not just a list of map file names, but also includes samples of each of the maps. But this document is maps only, whereas FTPmail can be used to obtain just about any product made by the NWS, including all reports and observations, and such important ones for offshore as the Metarea forecasts and tropical storm advisories. Also, none of the files are actually linked in this presentation. In short, both of these alternative discussions of FTPmail are better than the simple FTPmail.txt, but neither one of them, nor both together, is as good as the set of hidden instructions in the back of rfax.pdf, which stand out first because they provide live links to the data and second they specify the broadest range of products, directly without reference to other documents. For that reason and others mentioned, it seems navigators will want to download this file and store it on one of their their devices they will have when underway.